If you fought the Bydo and shot the Bacterians in their core, you are ready to battle the evil god Hydorah. Choose the path to follow and fight planet by planet against hordes of meroptians. 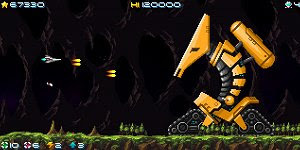 The game features lots of short and intense levels with fantasy spacial landscapes, unlockable weapons and secrets, and a large library of enemies and bosses. There is a single dificulty level, based on the 80's standards. It can be very hard, but with every beaten level there will come the glory.